We just celebrated the 16 Annual Salmon Fest among the Prince of Peace Lutheran Church Staff. Another great late afternoon and evening together with remarkably awesome team mates. Combine all ingredients in a bowl and let it mellow for an hour in the fridge. 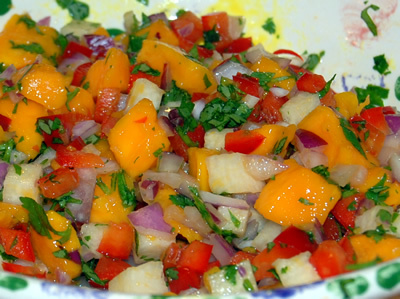 This salsa goes very well on top, underneath or on either side of grilled salmon. If you don’t have salmon, just get a spoon and eat the salsa out of the bowl.